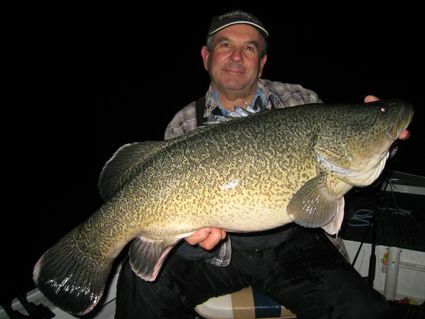 Headlines:The fishing over the weekend was generally quite good. The Soft plastic spinning in Eucumbene continues to be a great method of catching some big numbers of fish and the polaroiding and bait fishing in Jindabyne has been good too. The quality of fish from Jindabyne has been excellent as shown with this cracker of a Brown caught by Brad on a Scrub worm. This quality of fish will be available for some time yet. Lake Eucumbene:- Polaroidng has been quite good around the Dam wall with some very big fish being spotted cruising in close. There are not huge numbers and the steep banks can be a challenge but the chance of hooking a monster is high. Other areas worth trying are the River Mouth, Dam Wall and Old Adaminaby. Try using bead head Woolly Buggers in olive and brown, a Bushy's Horror, or a size 10 bead head black or brown Nymph fished with a very slow figure of eight retrieve. 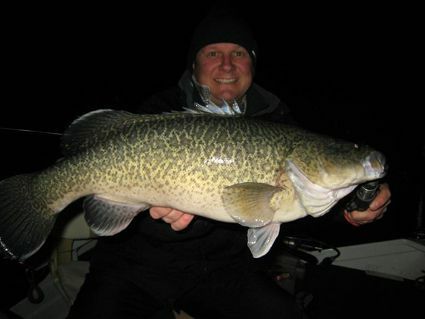 Lake Jindabyne:- No reports from the weekend but some great fishing will ensue as more fish drop out of the river and into the lake. There have been a number of Browns caught in recent times that have not run to spawn. These fish have had awesome condition and really play up when hooked. These fish have been eating Goldfish that inhabit the lake, some of which are as large as you hand. Large flies are the go for these fish feeders. 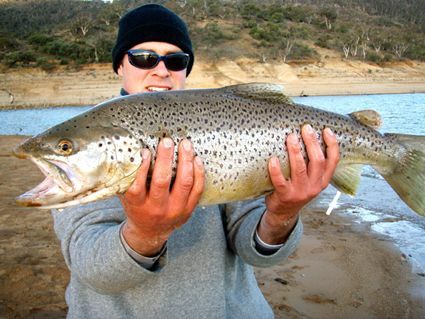 Some nice fish have been caught in Jindabyne on the rough overcast days and a few on bright still days. 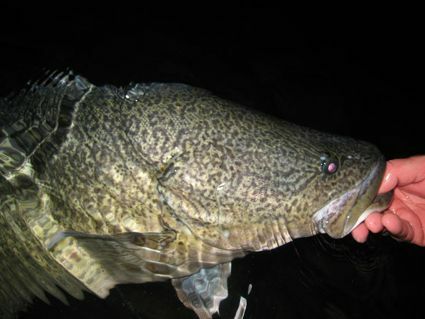 There are big numbers of fish in the Thredbo at present and these will drop back to the lake in the coming weeks and cruise the edges looking for a feed. It is still worth trying any of the boulder covered points and weedy bays are worth a search during the day. Although the overcast conditions are not great for polaroiding you will catch fish searching with a Woolly Bugger or similar pattern as the fish are a little less spooky in these conditions also. If you can coincide a trip with a large high starting down low in the bight that will travel across and give still, calm and bright conditions then Polaroiding is still worth a go. Best patterns for this fishing are the stick caddis, midge pupa, and black and peacock. Fishing these inert under a indicator is often the best method. At other times a woolly bugger or Bushy's Horror will work. Best areas to look at in Jindabyne are Sid's Bay, Rushes Bay, Kalkite, Creel Bay and Hatchery Bay. Fish can turn up anywhere so covering water till you find fish is the key. Eucumbene:- Old Adaminaby's ramp is still very good and is suitable for boats up to the 5 and a bit metre mark. A 4WD is a definite advantage with the larger boats as the water is a little shallow so being able to drive out into the water can be necessary. Spinning with soft plastics will be the best method over the next week or so. There are big numbers of fish to be caught casting through the trees. Don't be put off by the low water levels. The fish are a captive audience and the spinning has been as good or better than this time last year. 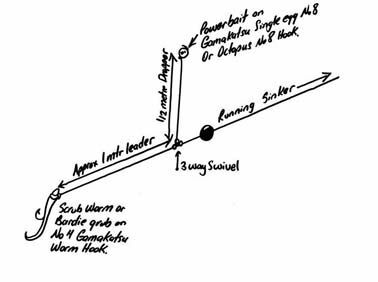 Drifting from a boat or casting from shore are both good methods using small medium sized Bass Minnows, Gulp Baits, Squidgy fish and Squidgy wrigglers on 1.5 -3gm heads. These are best fished with a slow roll type retrieve. Trolling has been at its best late and early in the day. Reports have been a little scarce on the troll overall but suggest that the deeper arms of bays and anywhere with clean water has been the most conducive to good fishing. Best lures at present are Tassie Devils in colours Y48, 55, 86. Lofty's Cobras colours 51, 100 and 17. RMG Scorpions colours H59 and H60. The River mouth and Island areas have been the best places to troll. Kalkite and Hatchery Bay are also worth exploring with a few lures. Blowering:- We don't tend to get many reports from Blowering but this one was emailed to me by Brett Wood and just shows that there is some great fishing to be had there. J.A with a great Winter Cod. Back into the water to be caught another day. With the unsettled conditions fishing has been good right through the day. With the evenings and mornings being the best on the calm clear days. Make sure you have your gloves and beanie and all the other warm gear as the frosts have been HUGE on some mornings.